Heal your gut, prevent disease, and slow aging--one bite at a time! 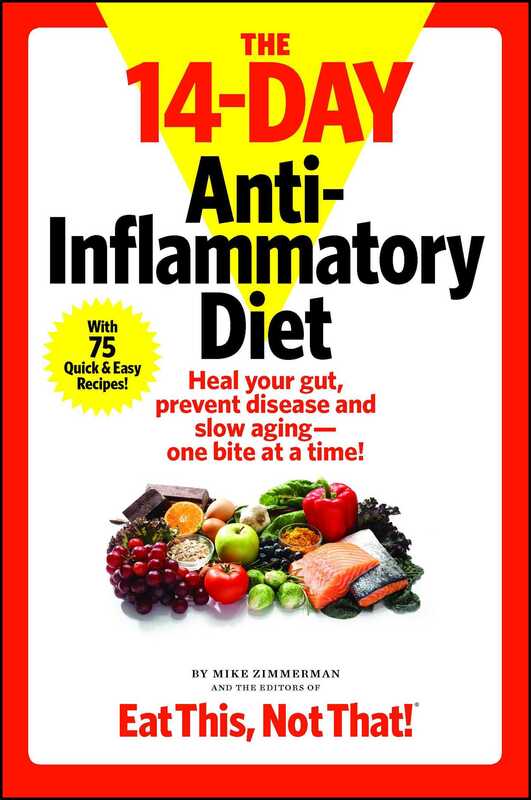 Stop Inflammation to Prevent and Reverse Disease for a Longer, Happier Life! Discover the secret plan that jumpstarts your immune system and eliminates the silent killer that may be smoldering inside you. You may have inflammation and not even know it until it emerges as weight gain, fatigue, high blood pressure, or type 2 diabetes. But now you can take back control of your health! Studies show an anti-inflammatory diet can help you reverse or avoid cancer and beat heart disease, arthritis, Alzheimer's, IBS, psoriasis, insomnia, and leaky gut. The science-proven plan and delicious recipes in this book will help you dramatically improve your health and lose weight fast--in just 2 weeks! Health journalist Mike Zimmerman and the editors of Eat This, Not That! magazine have created a lifestyle plan to reverse inflammation by replacing your diet of processed, toxic fast foods with delicious, wholesome, plant-based meals that'll keep your body looking youthful and strong. The book features 75 quick and easy recipes that will help you lose up to a pound of toxic belly fat per day, and stay lean, healthy, and energized for life!